An exhibition by Betty Pabst. There is photography and a short movie to see, texts to read and an audio collage to hear. ... a state in between, but which can last for as well several years. It is shaped by inforced waiting, inaction and isolation in a place that is usually far from the cultural and social life of the centers of the cities. In common it is situated in some industrial suburbia or a temporary cottage in the middle of nowhere. Under inhumane conditions many imigrants have to suffer the long and devastating trials in which 99 % of all asked applications for political asylum are rejected. These trials last a long time. During these times of waiting the asylum seekers have to stay in their clearly defined spaces, they are supervised,they are not allowed to work or to travel and they permanently suffer on fear to be rejected and sent back into living conditions that are even worse. 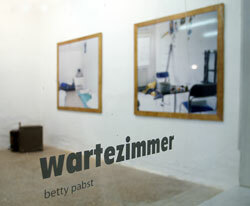 Please check the website www.bettypabst.de for more information.